* This table is usually available to ship within 2-3 business days. The Earthlite Avalon XD Massage Table Super Package from MassageTools is a great alternative to more expensive massage tables, offering comfort and perks without the big price tag. The Avalon XD has many of the same features of Earthlite's premium Spirit massage table, but costs just a fraction of the price. The massage table comes in a standard size and is available in several attractive color choices. It has excellent cushioning, a Reiki end plate on one side and the best flex headrest of any table on the market. 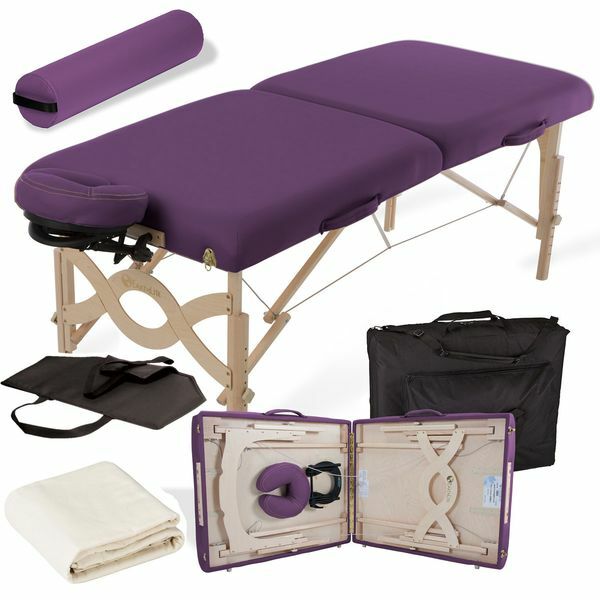 MassageTools' Avalon XD Massage Table Super Package offers an unbeatable value and includes the massage table, a fully adjustable headrest, a premium carrying case with a single pocket, a padded armrest sling, a 6-inch full round matching bolster, a sheet set and a face rest cover. The table holds up to 750 pounds. However, this versatile massage table is actually light enough to be carried. 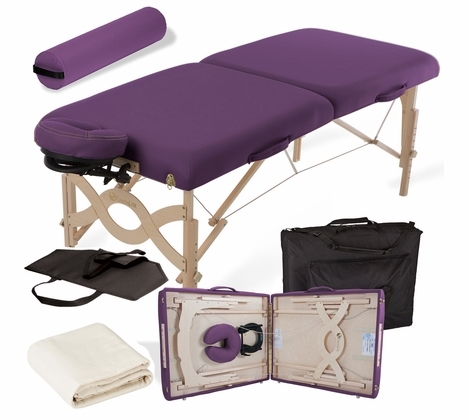 As an added bonus, the Earthlite Avalon Massage Table is shipped free by MassageTools. The Earthlite Avalon XD Massage Table would make an excellent addition to any spa or physical therapy facility's massage therapy tools and equipment. It is easy to move and offers clients and patients comfort amenities to enhance the massage experience. And thanks to the super package available from MassageTools, the Avalon XD Massage Table comes equipped with a fabulous set of features. � Premium Avalon XD Table with lifetime limited warranty. � Patent pending Flex-Rest� Self-adjusting Facecradle with Form-fit� memory cushion. � Heavy duty, carry case. � Matching 6" Full round bolster. � Deluxe 3 piece cotton flannel sheet set. � Managed forest hard Maple and lightweight aircraft grade decking. � Buttery soft, yet eco-friendly Natursoft� upholstery in seven colors (Amethyst, Mystic, Burgundy, Black, Teal, Hunter and Vanilla Cr�me). � Luxurious 2 �� multi-density, CFC free cushioning system. � 1000 lb. aircraft grade steel support cables. � Precision milled and crafted by Earthlite. I like the Avalon very much so far. It is quite comfortable I am being told. Very easy to set up and store. I do believe it is heavier than the weight listed though. This is my first massage table, and I purchased it for home use. Neither my wife nor I are professionals, but we both love receiving massages, both from professionals and at home. I thought this table would be a great way to surprise her with something both fun and useful for Christmas. I read reviews and looked at various tables online. I chose Earthlite because the company seemed to have a great reputation for quality, and this table because the Massagetools.com package was a great deal. The table (and accessories I purchased) arrived in just a few days, in perfect condition. We are extremely happy with the purchase--so much so that just for fun we enrolled in a massage basics class. The Earthlite Avalon table is extremely sturdy, incredibly comfortable and roomy (I'm 6'1"/195), is very easy to put up, adjust (height), take down, and fits easily into the carry bag. My only complaint is that I wish I'd thought of doing this 20 years ago. I would recommend the Earthlite Avalon and Massagetools.com without reservation. Love it, this table is awesome! Only wished it weighed less. The table, bolster, area sling are all wonderful. I give the sheets a fail. The sheets are to big for the the table, the face cover is too big and they are very light. The sheets are so much bigger than the table that when the client turns over the fitted sheet comes off the table. I know they came with the package, but Earthlite usually makes a good product. I am very happy with this package! The table is very sturdy and just perfect! Item as described. Terrific deal because the package included Sheet set, bolster , & comfy headrest. Table solidly crafted, easy to set up, & adjust height. I love this table and accessories. It's just what I wanted and you don't always know that when you order from a picture and description. I had a very good experience with Massage Tools and I'll certainly order from them again. From time ordered to recieved was very short! Everything came in excellent condition. Was very pleased to have so many items included with the package. Easy to handle, pack up, and transport to other locations. Sturdy and comfortable. Easy to setup. I love love love this table! Not only is it a great deal, but it's very good quality. It has very thick padding and is super comfortable. I am very pleased with my table and the package deal that was offered to me. I read reviews on the arm sling and how difficult it was to attach; however, i figured it out no problems. Furthermore, I was very pleased to receive the free bolster with my table. Since I have started using it, I have had ac surgeon say it is a great quality table, which is quite a compliment from someone who performs gastric surgeries (which he says has the nicest tables and that mine was comparable to it). Thanks for the great package deal! I'm a massage so student so I have lots of "clients" using the table to I can practice on them. All have commented on how comfortable it is. found the Avalon XD package on other sites for the same price. The Supoer package includes a bonus bolster and sheet set. The table is great too!